Their reason for rejecting me is that they have reached a point in their life where they couldn’t date anyone just for the fun of it. They want a relationship that would lead somewhere and that ‘somewhere’ is marriage. I find this confusing, yet hilarious. Here I am, asking a girl to date me and she is already talking about marriage. For me, dating someone is an opportunity to know each other and determine if we were compatible. These girls make it appear they know we're already compatible before getting to know me. All my wonderful personal qualities do not matter because their decision isn't based on me but on my wedding potential. They have subjectively assessed me to determine if I had the potential to get married quickly. And since I was a job seeking undergraduate, they did not see any early wedding potential. All my attempts to sweet talk them resulted in “You are not yet ready”. Recently, I asked single women in their early-twenties what the most important criteria they used in deciding who to have a relationship with was, and I got answers that included spirituality, good looks, responsibility, caring. The next question I asked was if they would love to get married someday, and they replied in the affirmative. I followed with another question, “Will you date a very spiritual/good-looking/responsible/caring guy if there was no possibility of him settling down [for marriage]?” A significant number of them answered “NO”. One interesting response was, “He must be sick! No one would date him”. My final question was, "will you agree the marriage potential was more important than the criteria you mentioned earlier?" The response to this was an outstanding "Yes!" 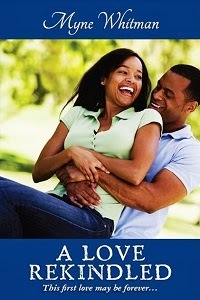 • The potential of marriage is the most important criteria females use to decide with who to have a relationship. • The higher the wedding potential a woman perceives in a man, the more she finds herself attracted to him. • The wedding potential precedes other personal qualities which the woman admired in the man. • If the wedding potential a woman perceives in a man would take a longer time, the less likely she would want to be in a relationship with him. From this experience I learnt what power the wedding potential had over feelings, even love. Once a woman perceives good wedding potential in a man she begins to see desired qualities in him. This was contrary to what some women believe: that they must see the physical or other characters they desire in a man before falling in love. Last week, an older friend of mine received a phone call from his ex who left him years earlier for a more financially stable man. She called to catch up on old times. From their conversation, it became obvious she was now engaged, but her fiance had recently left the country for an 18-month Masters programme. She was in her late twenties and thought 18 months as a long time to wait before marriage hence the call. My friend now had a higher wedding potential, being that he was still in the country. I learnt from her actions that some women are willing to throw away years of relationship with a wonderful man if a quick marriage was not included. Mila Kunis in the movie ‘Ted’ illustrates the theory of wedding potential. On the fourth anniversary of her character’s relationship with the boyfriend, she hoped he would propose. He didn’t, so she began to question his maturity and for a short period ended the relationship. She had a happy ending only because it’s a movie. Wedding Potential is based on assumptions. 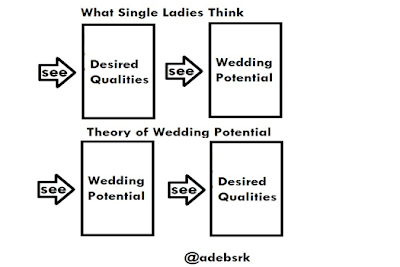 Women have various subjective ways of assessing wedding potential. It could be based on factors including religion, race, age, tribe, family acceptance, social status, and educational qualifications. A woman might believe a man from her own religious group, race, and social status had a higher wedding potential than those that were not. A woman that thinks her family would reject a particular man might not see the wedding potential in that man and decide not to date him. For her to accept to be in a relationship with him without their approval, he must guarantee her marriage. Another assumption is that a financially stable man was more likely to get married than a man who is unemployed. Another is that a relatively older man is more likely to get married than the woman’s peers. Again, these assumptions vary but they all boil down to wedding potential. 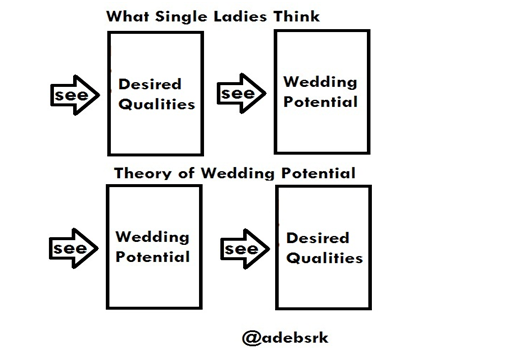 The theory of wedding potential points to the importance of marriage in our society. A significant percentage of women see marriage as compulsory. Despite the increase in failed marriages, they are ready to put their happiness on the line. They will ignore all the personal qualities they want in a relationship from a man, just because they want to be recognized as a Mrs. Maybe that is why broken marriages are on an increase. Women enter relationships just for the sake of wedding potential. However, to confirm this theory, I need help. If you’re reading this article and currently in relationship, was wedding potential a major criterion for agreeing to date the man? If considering a new guy, how high does his wedding potential rank? Adeshina Tunde blogs as @adebrsk at Story of the Year. He says of his writing, "Everyone have their experiences and what we do with it is totally up to us. Some store them as secrets while others turn them into laughs and share them with their friends. I've found what to with mine- write them as stories and give it to the world. These experiences are my stories of the year."